No, this recipe doesn’t require you to go catch a bunch of lady bugs. All you have to have is a handful of cherry tomatoes, a little Mozzarella cheese, a few basil leaves, black olives, and a tad of balsamic vinegar. 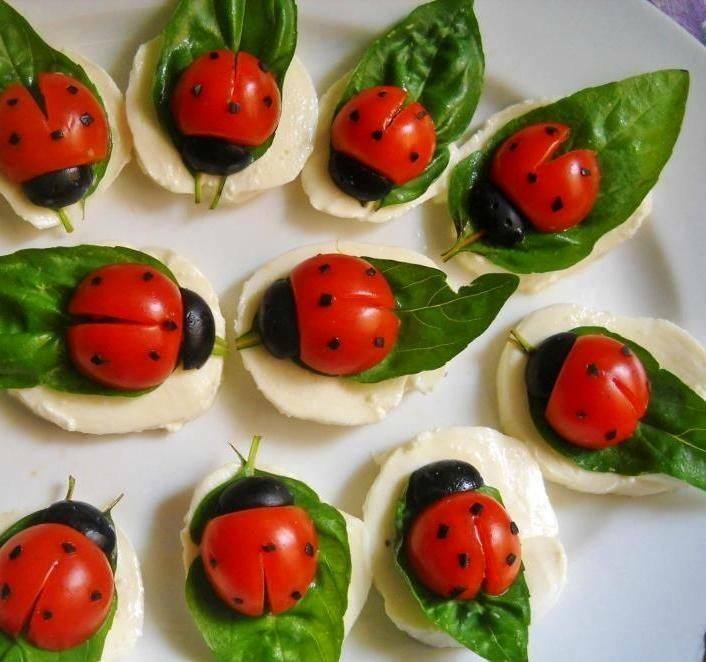 Flatten a small pinch of mozzarella cheese into a circle to make a landing pad for your lady bug. Lay a whole basil leaf on top of the cheese. Cut the tomatoes in half, then split one end slightly to make the division of wings. Now cut a black olive in fourths, longways to make the head. Place one quarter at the opposite end from the split wings. Dip a toothpick into balsamic vinegar and use the toothpick to poke small holes in the tomato for spots. Take a picture with your phone and put it on FaceBook to show everyone how creative you are. Now you can eat this delicious salad.